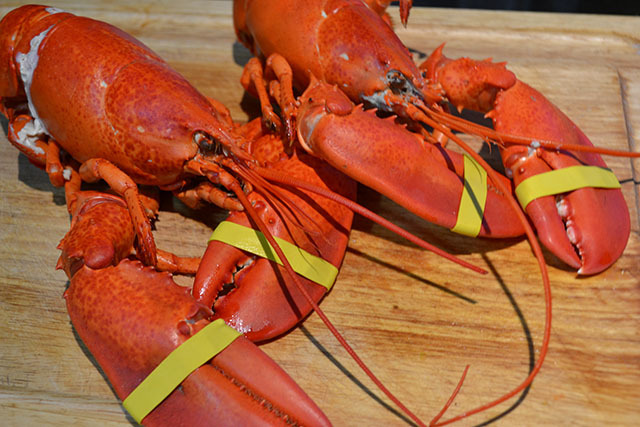 I have been determined to make lobster for this week’s Sprint Cup Snacks recipe for this weekend’s NASCAR race at Loudon International Raceway. in New Hampshire. Must have lobster when in New England. It’s a given! 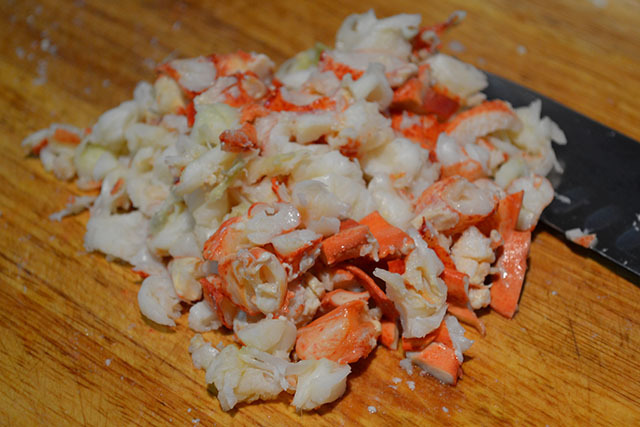 But my challenge was to make something that both Price and I would enjoy since he is pretty indifferent to lobster when I L-O-V-E it. Often it works out well that Price is ‘meh’ about lobster and I love it (although I do feel super guilty about eating them now that I read the most amazing book called The Secret Life of Lobsters where I learned that our tasty ocean bug friends are at least 7 yrs old before gracing our dining tables…) since he will put them in the pot for me. I just can’t! We typically do grilled steak and lobster… so I get the surf and he gets the turf… but I wanted to change things up so I had to go a searchin’ for something so mouth-watering that Price could not resist regardless of our royal red friend. 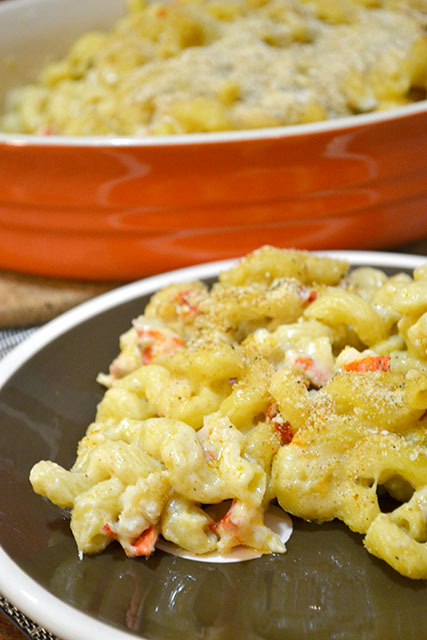 Ultimately I found the best recipe… drum roll please… Lobster Mac and Cheese. This was a very rich, luscious mac and cheese. Plus it was studded with lobster! If you don’t like lobster then skip it since the mac and cheese base is great anyway, but really, it is so worth it to add the lobster. PS- I learned my local grocery store steams lobsters for you for Free!!! I highly suggest you check with your grocery store because it’s a total GAME CHANGER! 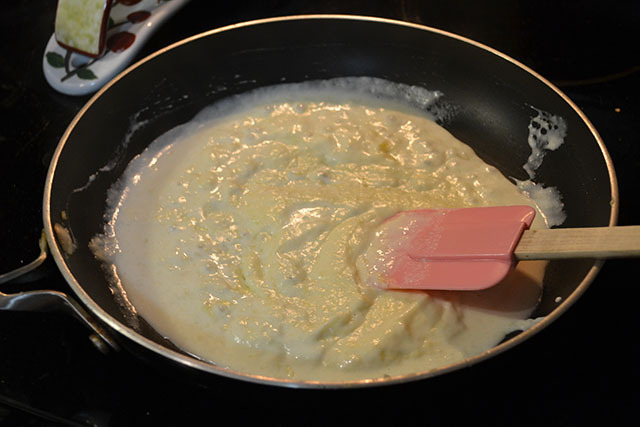 In a very large skillet, combine the butter and flour on medium low heat. Stirring constantly until the rue is golden brown. 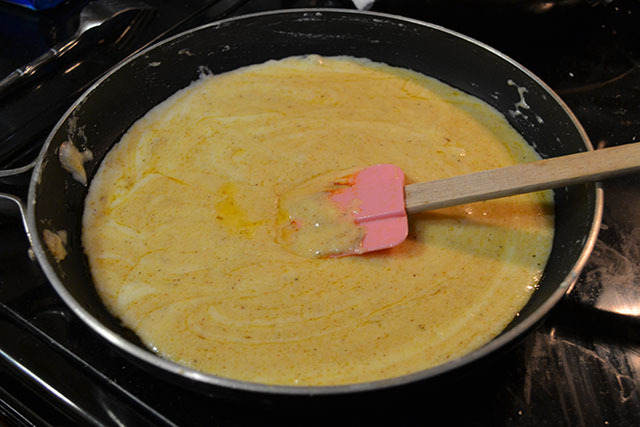 Add about half of the half & half to the mixture and stir to remove the lumps from the rue. Stir in half of the cheese. Once the cheese has melted into the sauce, add in the rest of the half & half, cheese, and the seasonings. Continue to work together until the sauce is evenly incorporated together. 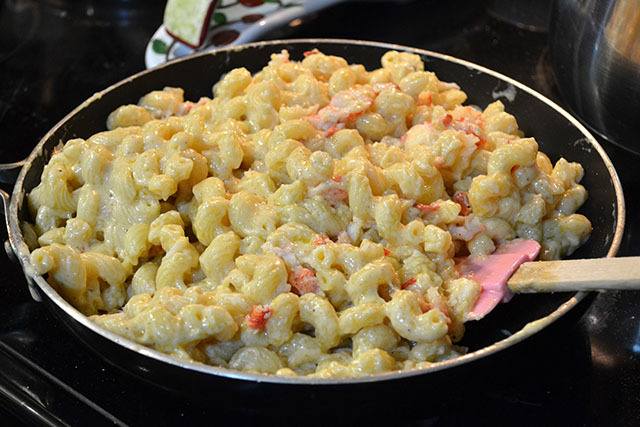 Add the cooked pasta and chopped lobster into the cheese sauce and toss to combine. Pour into a oven-safe casserole dish or 4 individual oven-safe baking dishes and then top with bread crumbs. Bake for 15-20 minutes. Just a few years ago my sister gave me a cookbook from the elementary school my nephews go to that was compiled from the families of the school. The best thing is that I used to go to that school and now my 3 nephews go there. In all, I love that all of these family favorite recipes are available in a cute little book that was sold as a fundraiser. I was browsing through it recently since I’m trying to make a point of using all of the cookbooks I have. A recipe for Penne alla Vodka jumped out at me and low and behold it was a recipe from my sister’s mother (my sister is actually my half-sister, if you haven’t realized that yet). It was funny how it all worked out. The timing of all this could not be more perfect sinse Tuttorosso sent me some canned tomatoes to try as well as giveaway, more on that later. Tuttorosso, meaning “all red”, has been a primary staple in the pantries of discerning cooks since 1929. They produce more than 100 products in their lines of whole, crushed, sauce, pureed, diced canned tomatoes. Plsu they have a line of jarred pasta sauces. Anyone would prefer to use fresh tomatoes whenever possible but when they are not in season, or a good quality then you have to turned to a great quality of canned tomatoes. Shoot, these tomatoes are even great to use to compliment fresh in seaosn toamtoes in a sauce. I was so impressed with the flavor and consistancy of the crused tomatoes. When you open a can of their tomatoes the first things you notice are how vilbrant and fragrant they are. The Penne alla Vodka was a huge success. I made a few changes to make it my own, like using panchetta instead of prosciutto, and increasing the amount of vodka. The starting point of a fantastic dish are great ingredients so from great crushed tomatoes to a good quailty vodka you will end up with a fantstic recipe. It is simple to whip up and makes for a great dinner to serve with some salad and garlic bread. In a large pot, bring salted water to a boil and then add penne. Cook until al dente. 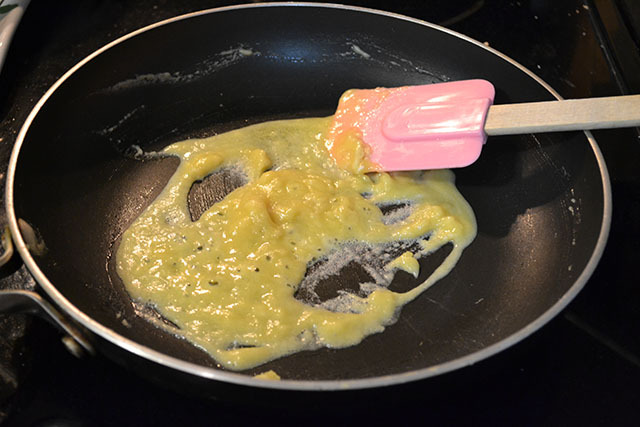 In a large skillet over medium heat, add the oil, onions, garlic, and crushed red pepper. Once the onions are translucent, add the panchetta. Cook until golden brown. Add in the crushed tomatoes and turn the heat up to bring the sauce to a low boil. Add in the vodka and heavy cream and cook over high heat for 5-10 minutes. Add the penne to coat the pasta. And now the good stuff… the GIVEAWAY! You can win your very one Tuttorosso package that includes 3 28-ounce cans of a variety of tomato products, pot holder, magnetic kitchen converstion chart, and recipes. Leave a comment telling me how you would use a can of crushed or whole tomatoes. Spread the word- Tweet: “I love tomatoes! I want to win a @RedGoldTomatoes gift pack from @iamahoneybee. http://wp.me/pzEAP-2XJ” Come back here and leave me ANOTHER comment telling me that you did. Follow @RedGoldTomatoes on twitter OR like Tuttorosso Tomatoes on Facebook for updates and to stay connected. Come back here and leave me ANOTHER comment telling me that you did. Contest Ends Friday the 21st at Midnight EST. Good luck but if you don’t win be sure to go to your local grocery store and pick up some Tuttorosso for your own home cooking.